April is Sjögren’s Awareness Month and you are the voice of the Sjögren’s Syndrome Foundation. That is why this April we will be using your words to help raise awareness of the disease. 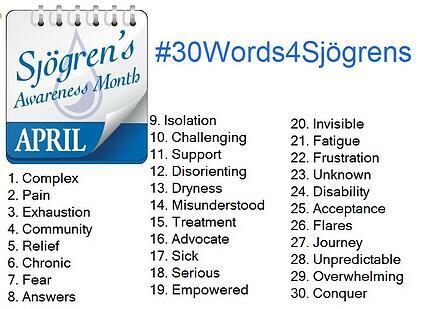 Last week we asked: "If you are living with this disease or know someone who is, what one word represents 'Sjögren’s' to you?" For the next 30 days, we will be posting one word every day that describes what the disease means to those affected by it, along with a fact or tip that relates to the word. We encourage you to follow us this April and look for opportunities to share how Sjögren’s has impacted your life. Awareness comes in many different forms, which is why we hope you will share our posts on your social media pages and help make Sjögren’s a household name! #Day1: Complex. Sjögren’s is not a “cookie cutter” disease & affects patients differently. Many patients experience dry eyes, dry mouth, fatigue and joint pain, but Sjögren’s also causes dysfunction of other organs such as the kidneys, gastrointestinal system, blood vessels, lungs, liver, pancreas, and the central nervous system. And while some people experience mild discomfort, others suffer debilitating symptoms that greatly impair their functioning. Click here to view our daily campaign on Facebook!